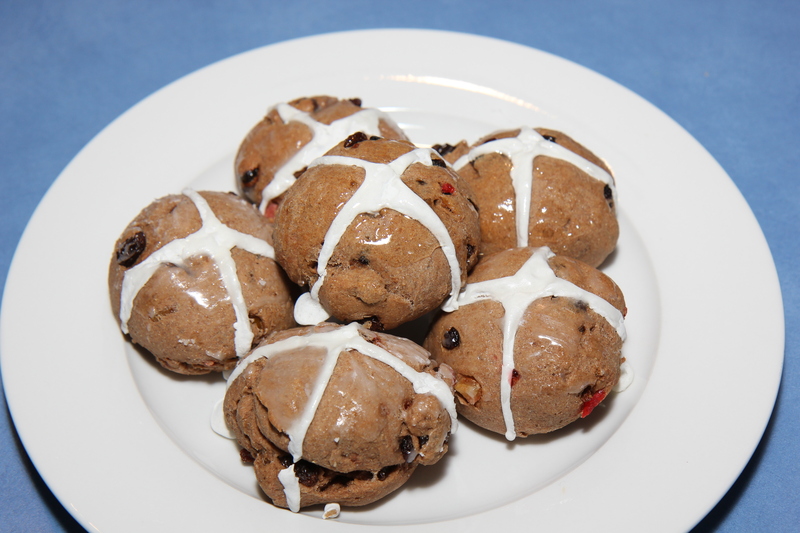 These are a more traditional version of those yummy Easter treats. They are a little quicker and less complicated than the ones I posted a couple of years ago but they aren’t gluten free because of the spelt (You can find the other version here). Or check out the my simple coeliac version after the recipe. These are delicious and my whole family scoffed them (… well, Ellie did, after I picked out her fruit 😉 I guess I’ll be making another batch that is fruit free). And I don’t think I’ve ever heard a more rapid response of ‘more more more!’ from George!! equal parts plain GF flour and water. Mix together until smooth and place into a piping bag (or a freezer bag with a hole cut in the corner). Place both ingredients in a small saucepan and bring to a gentle simmer. Stir regularly and allow to simmer for about 5 minutes. 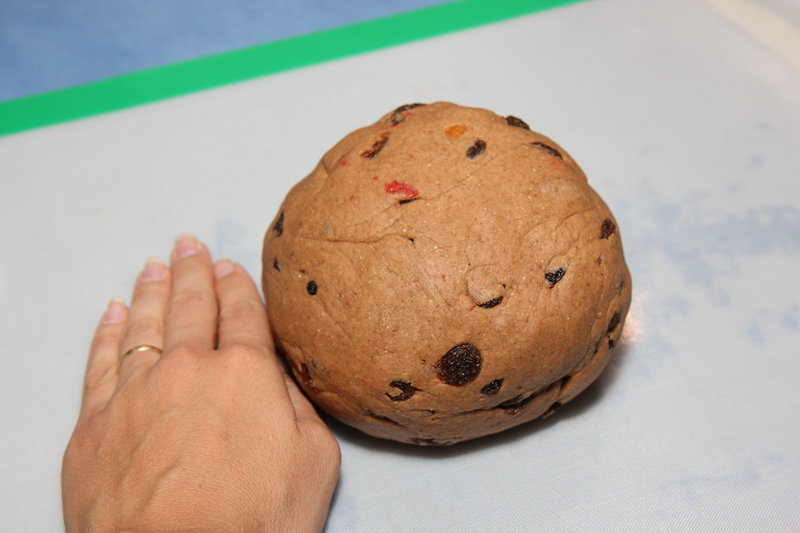 Tip the fruit onto the dough and knead again until the fruit is evenly distributed. OR if you’re using a machine with a knead function – tip the fruit in gradually through the top opening during the start of the kneading. Form dough into a ball and place in a bowl. Cover with a tea towel and leave in a warm place to rise for 30 minutes. Knock the dough down with your fingers and then break into 12 even pieces and place on lined baking tray. Leave tray in a warm (breeze free) area for about 45 mins to rise. Pipe the cross on to the buns and then place in a pre-heated 180C oven for 15-18 minutes. If you wish to use the glaze, gloss them with the sugar glaze using a pastry brush as soon as you remove the buns from the oven. Serve warm with you butter of choice. No glaze here – but half are choc chip. To make a coeliac friendly version: replace the spelt flour with 2 cups of a plain GF flour mix plus 1 1/2 cups of almond or seed meal (I make my seed meal from a equal combination of milled sunflower, pepita and flax seeds). GF breads only get one rise (without the gluten there isn’t the same structure for the CO2 ,formed by the yeast, to get trapped), so once you have made the dough, bring it together (skip the kneading step as there isn’t gluten to develop!) and break into 12 pieces of even weight, place on a tray and cover, allowing to rise for about 45 mins to an hour. (place them a little closer together than I did here, to encourage them rising up, instead of out!). Apply cross and bake following normal recipe. As with all GF products, they are best eaten fresh, but if you freeze them in an airtight wrap and bag, whilst still warm, the defrost and rewarm quite well. To make these a chocolate version (an anathema to me, but my kids have begged for them! 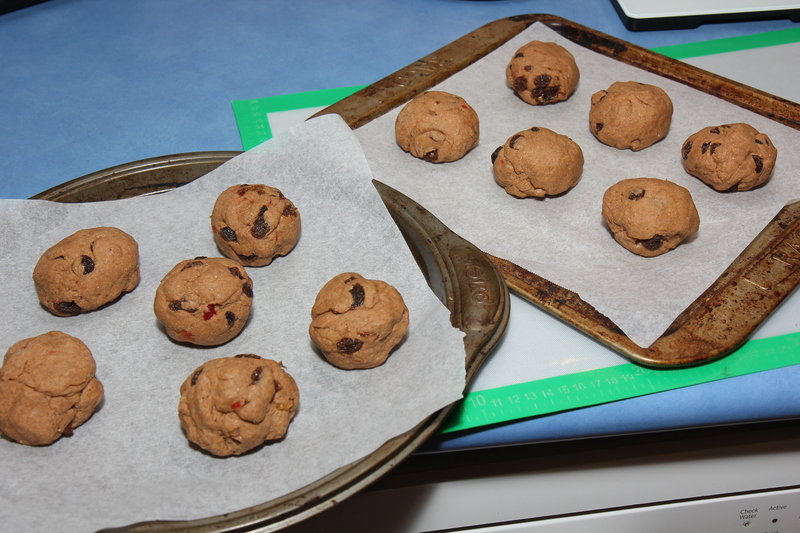 ), add handful of vegan choc chips. Don’t put the choc chips in the food processor, as they’ll get shredded. Rather add them in at the same stage you would have added the fruit. Then pipe with a chocolate cross (the normal cross mix, but remove 1 tsp of the flour and add 1 tsp pure icing sugar and 1/2 tsp cocoa). Preparing to remember Good Friday tomorrow.